Perfect instructional tool for a classroom or office environment! You know how it goes. During a meeting or classroom lesson, you get on a roll. The information comes to you so quickly that you run out of room on a chalkboard or attached marker board. You have to stop and wipe the surface clean. This disrupts the timing of your lesson and it derails the attention of your intended audience. What you need is a reversible board that all you have to do is flip it over and continue on uninterrupted with your presentation. 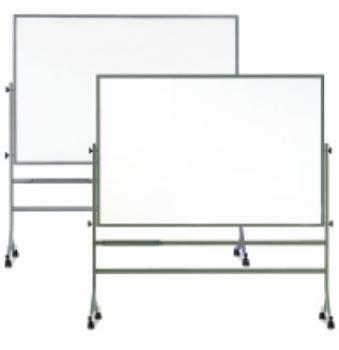 The Free Standing Dry Erase Board is the best way for you to get your message across. Our stylish, contemporary design seamlessly integrates with most office and classroom decors. 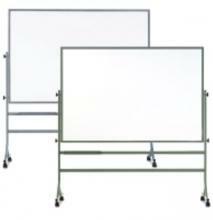 Yet, the beauty of the Free Standing Dry Erase Board is overshadowed by its rugged powder coated finish and steel constructed legs. We designed the reversible board with a unique lock pin system that keeps board remains connected, even when you aggressively flip it over between sides. You can move the board around a room and also keep it stationary by implementing the castor mechanisms on each wheel. The 4 by 6' surface provides plenty of room for multiple lessons.